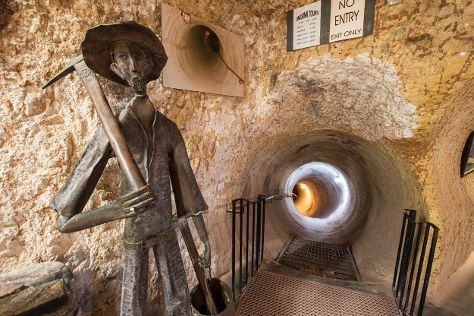 On the 6th (Fri), take an in-depth tour of Umoona Opal Mine & Museum, then identify plant and animal life at Josephine's Gallery & Kangaroo Orphanage, then admire the striking features of Faye's Underground Home, and finally take in the architecture and atmosphere at Catacomb Church. Here are some ideas for day two: see the interesting displays at Old Timers Mine, then explore the fascinating landscape at Breakaways Conservation Park, then explore and take pictures at Tom's Working Opal Mine, and finally take in the architecture and atmosphere at Serbian Orthodox Church. To see ratings, other places to visit, reviews, and other tourist information, you can read our Coober Pedy online sightseeing planner . In September, daily temperatures in Coober Pedy can reach 75°F, while at night they dip to 51°F. Finish your sightseeing early on the 7th (Sat) to allow enough time to travel back home.